LIMA — Downtown Lima, Inc. presents Downtown Lima Holiday festivities today. Several downtown businesses are taking part in providing holiday activities for children and adults. The event kicks off at 8:30 a.m. with people lining up at The Met, 306 N. Main St., for free photos with Santa. The photos will be taken from 9 a.m. to 1 p.m. The photo may be downloaded from Facebook or visitors may take their own with Santa and any of his special guests which include his reindeer, live and in person. 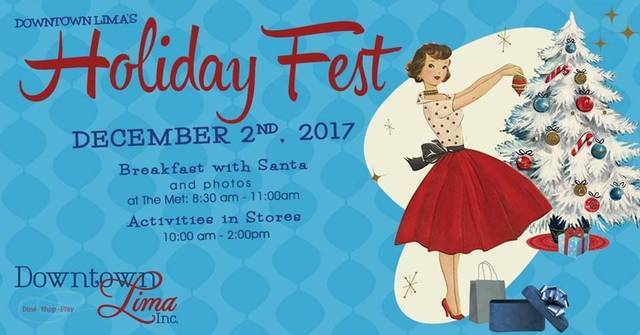 The Met is also offering breakfast with Santa (pay on your own) at 9 a.m.
At 9 a.m. Kohn’s Loan Company, 126 W. High St., will offer shoppers 20 percent off. Guests may enter the holiday drawing which features a grand prize of $2,500 worth of store credit. Three names will be drawn on Christmas Eve, second prize is $1,000 of store credit and third prize is $500 of store credit. There will be candy canes and coloring books for kids. Also starting at 9 a.m., the Lima Public Library, located at 650 W. Market St., will offer a “Make and Take Ornament” craft for all ages. A flash mob dance will start at 9 a.m. at the 300 block of N. Main Street. Nitza’s, located at 300 N. Main St. invite people to their store at 9 a.m. to view their retro Christmas window display and have pictures taken with Elvis. There will be free refreshments provided, and a chance to view the fall and winter collections at the store. The Meeting Place on Market, 200 W. Market Street is hosting the Shawnee Art Club at 9 a.m. The Shawnee Art Club will be providing free art activities for kids. Shoppers who still have their Downtown Shopping Passport with at least seven stamps may turn it in for a free small peppermint mocha or peppermint cocoa. At 9:30 a.m., Don Jenkins Jeweler, 117 N. Elizabeth Street invites guests to sign up to win a three-bead Christmas Chamilia set (valued at $99) anytime from 9:30 a.m. to 3 p.m. The winner will be drawn at 3:05 p.m. Starting at 10 a.m., Old Barn Out Back will be located at Veterans Memorial Civic Center, Room East 5, 7 Town Square, for cookie decorating. One free cookie to decorate per child. This activity will last until there are no more cookies. Alter Ego Comics at 230 N. Main St., will be taking geek holiday photos. Alter Ego Comics is open from 10 a.m. to 4 p.m.
Beauty by Jill, located at 226 N. Main St., will be making Jingle Bell necklaces starting at 10 a.m.
Also, starting at 10 a.m., Kelly’s Boutique, located at 220 N. Main St., is offering free fun activities for kids while adults get to browse their unique collection of jewelry, clothing, handbags and home decor. Crankers Cycling, 401 N. Main St., is hosting an open house celebration from 10 a.m. to 2 p.m. with refreshments provided by Biggby Coffee. Take a spin on a surrey. Aged to Perfection Boutique, 120 W. North St., is providing free Christmas tree ornaments for the making starting at 10 a.m.
Modern Rarities, located at 121 W. High St., is offering a 10 percent discount on all coin collecting supplies, starting at 10 a.m. The Allen County Museum, 620 W. Market St., is hosting the 45th annual Christmas Tree Festival from 10 a.m. to 5 p.m. today. The Christmas Tree Festival will be open from noon to 5 p.m. on Sunday.